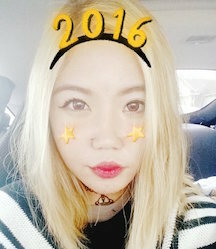 Cheers to the New Year & Resolutions~ | The Broke Asian. Excuse the hair all-over stoic face & peeling chin. Shoutout to SNOW for making me unnecessarily pale. I'm sure many of your already have noticed, but I changed my url! Though my previous username felt much more than an identity to me, I realized that a new year meant it was time for a new beginning. When I first started my blog a year ago, I was in somewhat of a recovery stage. Full time school and work was overwhelming and I would occasionally get countless anxiety attacks. There would be days when all I did was roll into a ball and cry for hours, not really knowing or understanding why. stressed, but kawaii will be something I'll always remember and cherish, as it was my beginning. Shijaki banida means that starting is half the task, or well begun is half done. When we take a stab at experiencing something new or different, we often have the courage to take the first step. The easy step. However, as more obstacles tend to get in our way, it's easier to just drop everything and move on to the next thing. This new name is a reminder that stopping halfway on something is no better than not starting it at all. I want to finally accomplish something and be proud of it. At work, my coworker wanted us to put our New Year's resolutions on the white board. While she quickly made her list, I stared at my blank space unsure of what I could possibly write that wouldn't turn into complete failure. Be Positive, Be Nice. As cliche it may sound, being nice and positive has always been a part of my list mostly because I have never fully achieved it. Dealing with anxiety and depression in the past really made me put everything in such a negative light for a very long time. Being in a dark period drains you, and I feel like I took it out on others that didn't deserve it. Through this, I also hope more happiness is just around the corner. Get fit. Another cliche and overused resolution. This time though, it's imperative for me. In the past two years of working at my current job, I have gained almost a total of 30 lbs (13.61 kg). In the beginning I didn't mind much at all, but I've currently been getting impairing migraines and stomach cramps. Not only that, but my energy levels are drained and I feel a sense of dread when I wake up in the morning. Awfully depressing, I know. While I have completely stopped drinking/partying this past year, I am definitely still living an unhealthy lifestyle eating junk and sitting around all day. My office plans on doing a Biggest Loser competition and the winner receives $1,000. Though I most likely will not win, I hope to use it as motivation regardless. TMI WARNING: I plan on doing a colon cleanse that supposedly also removes possible parasites in your body (ones we are not aware of). More info here. If you guys are interested in possibly an update about it, let me know! I probably won't take pictures of the results, but I'd be excited to share progress if anything does happen. Save money. I feel I have so much debt for my age (mostly from school), yet I can't hold back on making purchases. I'll be spending more time thinking about what I need rather than what I want. Reduce impulse buying! Take a chance. At the beginning of 2013, a lot of things changed. One of my best friends broke up with her boyfriend of 8 years, found her soulmate a month later, and then moved 4 hours away. By 2014, they were married and brought a daughter into this world in 2015. Though these things didn't happen to me, it did change my life drastically. The constant partying and drinking with friends every weekend stopped, and many of us just went our separate ways. I know it may not seem connected, but losing so many friends turned me into a hermit who became afraid of the world. Staying comfortable with familiarity was better than taking chances and applying change. This year, I want to put myself out there even if I may fail. Failure is what makes us stronger and hungry for more. I want to grow, travel, and be faced with new challenges. I know I probably sound like a broken record with these resolutions, but I will continue listing them until I do see some change. Reading it here, it looks and seems easily within my grasp, but it really hasn't been. I have so much work to do on myself, and I'm both scared and excited with what 2016 will bring. Let us all forget the pain and troubles encountered in 2015 and focus on the new happiness this new year will bring! Stay safe, stay awesome. P.S. If you haven't already, check out my previous blog post discussing my skincare routine and a giveaway!